barton originals: Cool Free Stuff...If You Are Lucky! Blog giveaways, don't you love them? One of these days, I'm going to have my own blog giveaway, but until then I love entering them and I do hope to win one eventually. Three different giveaways that I have just entered are below. blog and site when you go to enter. artisan Heather of NiftyKnits. 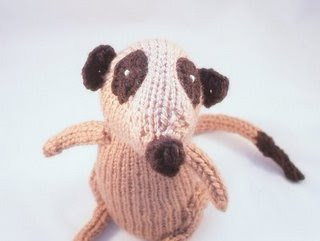 Heather knits whimiscal little critters, funky, fun items for home decor and fabulous jewelry, scarves and other accessories for you. Visit her giveaway by clicking on her link. 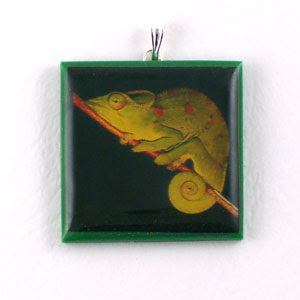 Giveaway #3 is Eugena at Polymer Clay Chameleon. I love her blog! Eugena is an incredibly talented artisan in polymer clay, however she also features different polymer clay artists constantly and I have discovered so many amazing items created by such talented artists (now just need to find my pot of gold!). Eugenia's blog giveaway runs for the whole month and all you have to do is comment on her blog. She has not posted what this month will be, however here is last month's fabulous giveaway. So have fun and enter...who knows you may be lucky! Wow! Neat stuff Sue! Thanks for always posting such great things! Thanks Sue, I just love Creepy and want him to come live with me..:) Denise's blog is great and I have been in her store before..so remarkable. 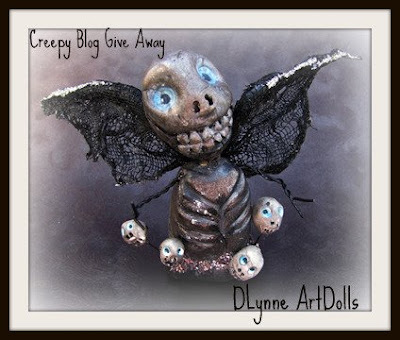 I did put her and the giveaway in a blog tonight. Thanks for the feature Sue - I shall go and check out the other two! Thanks for sharing Sue! I need to do a blog giveaway too! As soon as I get time I'm going to dive into this! Sue, this is wonderful...Thanks so much for posting these and letting us know about these fabulous artists and their amazing giveways.